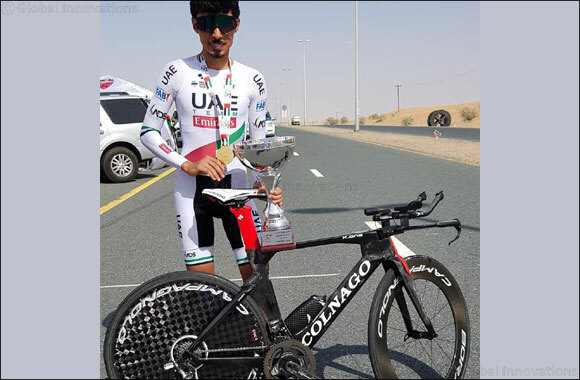 Dubai, UAE, April 1, 2018: UAE Team Emirates’ Yousif Mirza sealed a UAE National Championship double, after the Emirati finished first in the Time Trial event on Saturday afternoon, adding to his record-breaking Road Race victory last weekend. The win – his third consecutive in the UAE National Championship Time Trial – adds to what is becoming a remarkable season for the rider, having won the continental title in the points race at the Asian Track Cycling Championships in Malaysia, as well as the Asian Road Cycling Championship and the Omnium Track Cycling silver medal earlier this year. The Emirati will next turn out for UAE Team Emirates at the Tour of California in May. The team’s participation on the UCI World Tour gives the local community the opportunity to come together and support world-class athletes as they aim to become one of the top cycling teams on the tour.